The 88-room and suite Hayfield Manor Hotel is a luxurious oasis located in the city center of Cork, Ireland, where the owners have gone to great lengths to create a charming ambience with unusual surprises for the guests. Edward F. Nesta and I stayed at Hayfield Manor Hotel in September 2007, and were quite surprised to see a putting green located just inside the entrance to the grounds, this being a city center hotel, and also to see an aviary filled with exotic birds. Entering the attractive lobby there were two things that I immediately noticed, one the large, stunning floral arrangement on a round table in the center of the room, and two, the absence of a check-in counter. Instead of having the guests standing awkwardly about, they are invited to have a seat at a desk during the efficient check-in process. 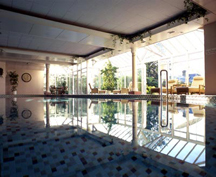 Although our schedule did not allow us enough time to experience their Spa, after a day exploring County Cork, we returned to the hotel and managed to find time to swim laps in the indoor pool, followed by a session in the steam room, and concluded with a relaxing soak in the secluded outdoor whirlpool surrounded with high hedges to afford privacy while enjoying the Irish air. We began our evenings in The Manor Lounge, with its comfortable ambience and interesting cocktail menu, listening to the piano music, which wafted in from in the lobby, before going to dinner in one of the hotel's two restaurants, presided by Head Chef Graeme Campbell, Orchids Restaurant for gourmet dining, and Perrots Garden Bistro, their smart casual restaurant. Dinner selections included such tempting courses as Crab & Prawn Linguine, Orange & Tarragon Cream, and Aged Parmesan Shavings; Three Pieces of Sea bass Fillet, Caramelised Salsify, Rocket Leaves, Sautéed Sweet Potatoes, and Light Cinnamon Emulsion; and Alaska Semifreddo served on a Soft Biscotto. After taking a stroll around our spacious suite, we were ready to move in! The suite was filled with thoughtful amenities including an umbrella and a walking stick in the umbrella stand in the foyer. 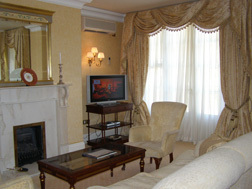 The sitting room featured a large gold mirror placed over the lovely white marble fireplace, the mantle was adorned with silver candlesticks and white tapers and Menton china, a cream sofa with decorative pillows and two chairs flanked the rectangular glass and wood coffee table, paintings and gold sconces with cream colored shades graced the walls, and the windows were opulently dressed with gold sumptuous floor to ceiling window treatments and ivory sheers. A multi-tier stand in the corner held a Philips flat screen television and a Philips DVD player. In the opposite corner, there was a desk with an arrangement of fragrant white lilies, and a desk chair, and tucked in another corner of the room, we were delighted to find a putter and an automatic putting cup, which we used to practice our golf and to hold mini-contests. The spacious dressing area held an antique armoire with a safe, iron and ironing board, robes and slippers, a mirror placed over a bench, and an antique bureau with mirror. Homelike details included a white embroidered tissue cover with lilies of the valley on it. The bathroom featured a floor with white and mint tiles placed on the diagonal, vanity with sink, toilet, a claw foot soaking tub, and a fabulous jet and steam walk-in shower. Other details included two hairdryers, vanity/shaving mirror, stool, heated towel rack, and Elemis brand amenities. Our bedroom featured a gold upholstered headboard on the king bed with matching attractive floor to ceiling window treatments. Thoughtful bedroom details included wireless and broadband Internet access, a Sony Dream Machine Radio/CD/Clock Radio, CD and Cassette player, and a flat screen television. Two wing back chairs with ottomans placed in front of the doors that lead to a small terrace flanked a round wood table dressed with a tall vase of white lilies, books, an exotic fruit platter, and a bottle of wine. Centrally located within walking distance of many of the Cork attractions and a short driving distance to others, Hayfield Manor Hotel provides the perfect base to explore Cork and the neighboring towns. Read more about Hayfield Manor Hotel in the Restaurants and Chefs' Recipes sections. For information on Ireland, please visit the website: Discover Ireland, www.DiscoverIreland.com or call them at +1-800-223-6470. For driving directions in Ireland, visit www.AAIeland.com.